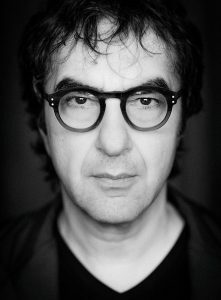 Last week I interviewed world-renowned film (and stage and opera) director Atom Egoyan, in connection with the first North American showing of his art installation “Steenbeckett” at Regina’s MacKenzie Art Gallery. The 750-word article I wrote will appear in the next issue of Refined Lifestyles Magazine, but I thought I’d take advantage of my blog to post a lightly-edited (for clarity and continuity) transcript of our entire conversation. He was a pleasure to talk to and I highly recommend taking in the installation (and the MacKenzie Art Gallery, one of Canada’s best) if you’re in Regina. You can read much more about it on the “Egoyan at the MacKenzie” website, from which allow me to quote the information about “Steenbeckett” you probably should know to make sense of the transcript. “Steenbeckett (2002) is the extraordinary result of an Artangel commission that saw the artist Atom Egoyan transform space in the former Museum of Mankind in London (UK). For the installation, Egoyan used excerpts of 35mm footage from his film version of the Samuel Beckett play Krapp’s Last Tape, which he had made for the project Beckett on Film (2001). In the film, a haunted sexagenarian (played by John Hurt) reviews reel-to-reel tape recordings which he made on previous birthdays that capture his self-important reflections on events of the past year. The piece immerses the viewer in Krapp’s reverie on the pain of hubris and memories of lost love through a dense aesthetic layering of technologies in space. Two thousand feet of celluloid travels around the darkened room on a system of pulley-suspended rollers, propelled through a Steenbeck editing table, whose small screen also serves as our fittingly obscure and distanced window onto Krapp and his story. With the wear and tear produced by each rotation of the celluloid through the system, the whole work edges, like Krapp himself, inexorably toward extinction. What drew you to Samuel Beckett’s play Krapp’s Last Tape? In junior high there was a drama teacher who introduced me to it—and it just blew my mind. It blew my mind because my father kept a diary every day of his life, still does, I guess, but there was a period where he was transcribing it onto a reel-to-reel tape recorder, so suddenly I was dealing with this character who could have been a projection of who my father would become, and I was dealing with this notion of this legacy of tapes that I knew I would inherit at some point, and what does it all mean? What does it mean to have this all these recorded memories if there’s no one there to kind of bother listening to the tapes, and threading it and cataloguing it? Suddenly here was a play about a 69-year-old man who on his birthday ritualistically listens to some recording he made of his birthday some year before. This particular evening he listens to a recording of himself when he’s 39, reflecting on himself in his late 20s. This ability of this one character to move around in these three different periods of his life, in a linear form, was just so succinct and so provocative. Sometimes a play doesn’t translate well to film because it’s so static, trapped in a single set. This sounds like something that would translate well, though. As I’m recording the performance I’m very aware that I’m bringing in another recording element, besides the tape: my camera is a very conscious recording element. It creates a very particular alchemy. We’re also setting the play in a room that’s quite naturalistic, so I don’t think it feels theatrical at such. That being said, you’re really aware it’s all being played out in a proscenium way. You’re not seeing the whole room. There’s still a theatrical element. How did “Steenbeckett” come about? There’s a Steenbeck (editing machine) which powers the machine, and that’s my Steenbeck. It’s huge. It’s also powering the film around the gallery, through the room. The piece came about because when I was editing it on this machine I was delighted by the fact that here was a film about an old man with a reel-to-reel tape recorder: we see these reels very visibly in the frame, but they somehow mirrored the reels on my editing machine. As I turned the machine backward and forward, the reels on the machine on the screen were also turning backwards and forwards, and that seemed really delightful. I felt like a child, playing with this toy. I think we’re fascinated by this idea of movement of reels, it’s just something that connects us to the process of laying down memories and taking time. It suggests that there’s an anxiety that we’re going to run out of material to record, or that there might be something that breaks or gets scratched or is somehow compromised, and we don’t really think about that with digital, it’s quite abstract. This is a meditation on that moment when we were still dealing with a technology that mirrored aspects of our own body. One of the interesting things is that the film is continually degrading, just like the character in the play is continually degrading. Do you use a fresh print at the start of each installation? That’s part of the piece. There’s a new print that is presented, and then at the end of the installation that print is discarded. It’s usually in terrible shape. It depends on the conditions of the space. If the space is dusty, it will degrade much quicker, because the dust will accumulate on the print, and it will begin to create scratches. It’s probably going to last longer here. Each time you install it, it’s different. When you came to look at the space it was going to be in at the MacKenzie Art Gallery, how did you decide how to change it? This is the largest space it’s been in. It was originally shown in London at the Museum of Mankind. It was shown in two adjacent abandoned cinemas—they were connected. In each place it’s shown, Birmingham and Manchester and Ireland, it’s always reacted to the space that it was presented in, and sometimes they weren’t traditional gallery spaces. This is the first time it’s actually been in a more traditional gallery, but also a really large space, and so we’ve been able to do things that have never been presented before, in particular this large-screen projection of the actual film, and also the installation of the editing bench that I brought from Toronto that the film was actually made on. So, those interact with the “Steenbeckett” machine in a unique way. The film was always shown in a separate room, or on a smaller screen. It’s also high-def, so that gives it a sense of detail. It’s really quite remarkable to be listening to the soundtrack coming from the Steenbeck, as it’s playing this film loop, and see the image, silent. (You can hear if you put on the headphones.) There’s a disparity between the synchronization of the image and the sound you’re hearing, and I love that idea, too, because it feeds into this idea of the editing bench, between the two, because that is the space where you would synchronize sound and picture. Both the film and the installation are things you created several years ago. As a novelist, when I go back to books I wrote several years ago, I find things I would have done differently. Some things I don’t even remember writing. Do you find that when you revisit a work like this? The beautiful thing is you can reinterpret it. This is a major reinterpretation from other versions of it, and using my own machine, which I’ve never been able to do, gives it a more personal element, I think. It feels fresh. Watching an old film, you can’t change that, the film is fixed. Though I had a really interesting experience this summer. I met some younger people who said, “Oh, my God, you’re the person who made…”, and usually it’s either Exotica or Sweet Hereafter, but it was Where the Truth Lies, which I don’t think of as being one of my better-known films. I went (with them) and saw an Italian-dubbed DVD. It was a completely different movie. The dubbing was done so well, it created a very different energy. So sometimes you can see an old work and someone else has reinterpreted it. I don’t think that happens to a writer if it’s in a different font. The novelty of that probably wears off pretty quickly. But when you’re hearing a dubbed version it really does change the complexion. Do you find something new in the film each time you look at it? Films are largely…well, not exactly passive, because you engage with them emotionally and intellectually, but you’re sitting in a room and you’re watching something on a screen. Something like this puts you inside a three-dimensional environment, of which the film is a part. How do you think that affects the viewer’s interaction with your film? I think we’ll find out. I’m not sure how much people will watch the film, the high-definition version with the headphones (it’s an hour), how much people will watch that and still interact with the Steenbeckett, or what people’s experience will be. That’s always the big question, anytime you’re seeing a video in a gallery. Do people know when it begins, do they wait until the beginning time, do they actually sit down and watch the whole thing? I would think in this particular case people will make up their mind as to how intense the encounter will be, how much time they’ll spend with it. What do you hope viewers will take away from “Steenbeckett”? I think what you can’t help but take away from it is the idea that this piece of text has been really fetishized, that there’s something about what Beckett was trying to express that has really impressed itself on a lot of different artists, not just me. I think he’s had a huge influence on a lot of different people, but my particular obsession with this text is something that just seems to be able to renew itself. I’ve done other Beckett projects, I did a production of his television play Eh Joe a few years ago, with Liam Neeson and Penelope Wilton at the Lincoln Centre, and it was one of the high points of my life. I just loved being in that world, and listening to that language. He is the line between James Joyce and Harold Pinter and David Mamet. What I’ve taken the liberty of doing with some of the texts…his own direction for Krapp’s line reading is it should very fast and almost thrown away. In my two dealings with him, both Hey Joe and this one, I’ve allowed the actors to really luxuriate in the text, to find the words and to relish the poetry. Do you distinguish between your work as a film director and your work as an artist, or is it all just one thing? It really is all one thing. I mean, there are obviously different considerations, and I’m working for different audiences. My films have wildly different budgets, some are commercial and some are more personal, and I do opera and theatre, and each one has different expectations, and you have to be aware of that as you’re working with them. The lovely thing about being in a gallery space is you can be quite hermetic in a way, your questions and your approach can be quite oddball, and that’s okay. It’s okay to be very eccentric—and this is a profoundly eccentric work. I wasn’t sure how I’d feel about coming back and remounting it after this period of tme, but I’m really excited about what we have in that gallery right now.